Onshore unconventional gas operations, in most jurisdictions, operate on the legal principle that all activities during exploration and extraction are ‘temporary’ in nature. The concept that the onshore unconventional gas industry has a temporary effect on the land on which it operates creates a regulatory paradox. On one hand, unconventional gas activities create energy security, national wealth and a bourgeoning export industry. On the other, agricultural land and agriculturalists may be significantly disadvantaged by unconventional gas activities potentially producing permanent damage to non-renewable fertile soils and spoiling the underground water tables. Thus, threatening future food security and food sovereignty. 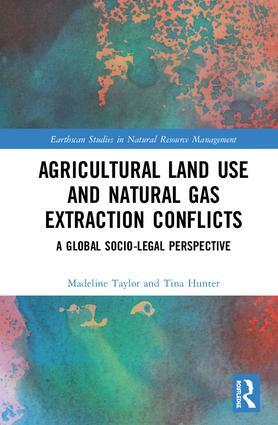 This book explores the socio-regulatory dimensions of coexistence between agricultural and onshore unconventional gas land uses in the jurisdictions with the highest concentration of proven unconventional gas reserves – Australia, Canada, the USA, the UK, France, Poland and China. In exploring the differing regulatory standpoints of unconventional gas land uses on productive farming land in the chosen jurisdictions, this book provides an original three-part categorisation of regulatory approaches addressing the coexistence of agricultural land and unconventional gas namely: adaptive management, precautionary and, finally, statism. It offers a timely and topical approach to socio-legal natural resource governance theory based on the participation, transparency and empowerment for agricultural landholders, examining how differing frameworks such as the collective bargaining framework can create equitable and sustainable contractual arrangements with unconventional gas companies. Madeline Taylor specialises in the areas of Natural Resources Law specialising in the regulation of land for multiple uses – particularly the intersection between energy activities on agricultural land. Her research and publications focus on the fields of natural resource regulation, resource development approvals in agricultural areas and private landholder resource compensation and negotiation agreements. She was awarded an Australian Postgraduate Scholarship and Dean’s Scholarship in recognition of the importance of her comparative law PhD thesis examining the regulatory coexistence of unconventional gas activities on priority agricultural. Dr Taylor was previously an inter-disciplinary Visiting Scholar at the University of British Columbia examining the regulation of shale gas activities within the Agricultural Land Reserve. She has also held research positions within the Centre for Coal Seam Gas at the University of Queensland and the Centre for Commercial Law at Bond University. Currently Dr Taylor holds an Academic Fellow position at The University of Sydney Law School and teaches Corporations Law, Real Property Law and Personal Property Law. Her multi-disciplinary research publications and grants to date includes over thirty-five papers and numerous governmental reports focusing on natural resources law, corporate law, competition law and agricultural law and policy. Tina Hunter is the Director of the Aberdeen University Centre for Energy Law (AUCEL) and the Professor in Petroleum Law at the University of Aberdeen. She teaches and researches in the area of petroleum law (offshore), Arctic resources law and shale gas law. She has received academic qualifications in marine sediments and geology, political science, applied science, and law, completing her PhD at the University of Bergen, Norway. She presently is an Honorary Professor at the University of Eastern Finland and Murdoch University. She has undertaken teaching and research in numerous countries including the UK, Australia, Norway, Canada, Iceland, Greece, Finland, Russia, the USA and the Philippines. Her expertise in regulating of petroleum activities has been sought worldwide, undertaking activities such as analysing petroleum laws, drafting legislation and advising governments, industry groups and NGO's worldwide.